Ask: Have you ever made an excuse for why you couldn’t do something? What was your excuse? Ask: Do we ever make excuses to God? Say: Sometimes God asks us to do hard things doesn’t He? And sometimes we might feel like it’s too hard for us so we might pretend like we didn’t hear God or make an excuse for why we can’t do it. When we do this, what we’re really saying is that we don’t trust God, and we don’t trust that He will be with us and help us. Ask: Does God promise to be with us always? (You bet!) So we can trust Him when he calls us to do something hard. We can trust that He will equip us for the work He gives us to do. Say: The word “equip” means to make ready or prepare to do something. As you listen to the story today, try to hear the ways that God equips Moses for the work God called him to do. Say: In our story we’ll hear how Moses had a hard time trusting that God would help him do a seemingly impossible task, and how God promised to help Moses every step of the way. Say: Moses had grown up in Pharaoh’s palace, but he knew that he was truly a Hebrew, just like the rest of the Israelite slaves. One day he went out to see the Hebrew people at work and noticed that one of the slaves was being badly mistreated by an Egyptian. Moses became angry and in a rage he killed the Egyptian. He knew that word would soon get back to Pharaoh about what he had done and he was afraid for his life! Moses decided to run away to the land of Midian where he lived as a shepherd for many years. Say: One day as Moses was out with his flock of sheep he saw a strange sight. There in front of him was a bush, but it was no ordinary bush. This bush was on fire! Ask: Have you ever seen something on fire? What happens to it after a few minutes? Say: When something catches on fire, eventually it will be burned up. It’ll turn black, and eventually be just ashes. 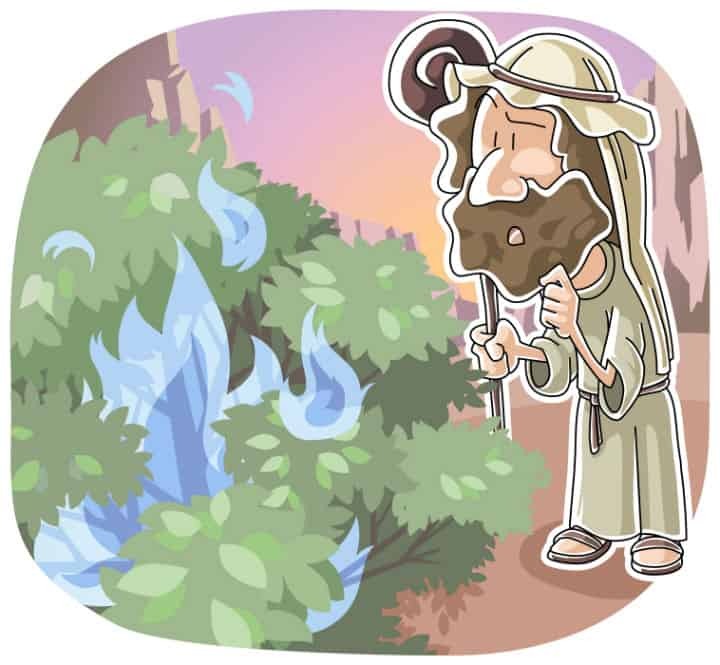 The strangest thing of all about the bush that Moses saw was that it was not burned up by the flames. Imagine what Moses must have thought! Say: Soon things got even weirder. Suddenly Moses heard God speaking to him through the flames! God told Moses that he was standing on holy ground so he must remove his shoes. Let’s read from God’s Word to hear what else the Lord said to Moses. Say: God had a big job for Moses to do! Ask: If you were Moses, how do you think you would have responded to God? Say: Moses didn’t think he was good enough for the job God was giving him. In fact, he was downright scared! He was afraid that the Israelites wouldn’t listen to him. He was also afraid because he wasn’t a very good speaker. Moses made all sorts of excuses to God about why he wasn’t the right man for the job. But God promises to be with those whom He calls! Moses didn’t need to be afraid because God would be with him no matter what. In fact, God would work through Moses to rescue the Israelites. Say: Moses was afraid that he wouldn’t know what to say when the Israelites asked who sent him to rescue them. Let’s read to find out what God tells Moses. Say: You see God is so big and so powerful that He can’t have an ordinary name like Bob or Joe. When God says that His name is I AM He is saying that He has no beginning and no end. He is telling Moses, and us, that He is the one true God, and we can trust Him! Say: It was hard for Moses at first, but he finally obeyed God’s call to return to Egypt to rescue the Israelites from slavery. Say: Sometimes God asks us to do things that might be hard for us, but in the end they bring Him the most glory. It might be something like being kind to your brother or sister. Sometimes it’s hard to obey God, but He always gives us the strength to do what He’s asked us to do! Explain that everyone will take off their shoes and put them in a big pile on one side of the room. You will divide the class into 2-3 teams (depending on how many kids you have), and each team will line up on the other side. When you say “Go” the first kid on each team will run to the shoe pile, find their shoes, put them on, and run back, tagging the next player who will then start running. The first team with all their players with their shoes on (correctly) wins. Have one child read God’s words to Moses in Exodus 3:7-10. Ask: Have you experienced hurt or suffering? If so, did you know that God cares for you? Ask: What was God’s plan to save His people? Say: Notice that God’s plan would be worked out through Moses. When we see suffering in our world today sometimes our response is to ask why God doesn’t do something about it. But God has sent us to the world to be a light and point people to Jesus. God will accomplish His plan through people like you and me who follow Christ and want to share the message of hope with the world! Pray that God would open the kids’ hearts to hear how He is calling them to impact the world around them for His glory. Tony Kummer (Editor) reviewed & updated this page on : November 3, 2015 at 9:46 pm. All our content is peer reviewed by our readers, simply leave a comment on any post suggest an update.